Discussion in 'Fiddleback Forge Knives' started by Fiddleback, Sep 2, 2015. Hey Phill. Awesome job on the lists of reviews. It helps so much to have all the links in one place. However, and I hate to be the one to say this, none of the links in the first post are working for me. The links in the second post all work fine but I'm getting a Not Found error. Even on the recent ones like Swonut's HB review. This could definitely be a problem on my end for some reason as nobody else has seemed to have this problem but I figured I should say something. Again, thanks for all the work that you do with your posts in this forum and I hope I didn't just create more for you. I appreciate the heads up. I'll work on figuring out why the review links aren't working. It might take me a couple of days because of work priorities right now, but I'll get it fixed. I apologize for the technical difficulties. Absolutely no need for an apology. The work you do on this forum is always amazing to me and greatly appreciated. I just wanted to give you a heads up. Like I said before, I hope that I didn't just create a bunch of new work for you to do. Nice job Double Barrel! You incorporated all the elements of a good review to give the reader a good sense of what this model is like in person. I especially appreciated your commentary at the end where you compared it to the Patch and stated what you liked and disliked about the EDC II. If you plan to keep this knife long term, then adding a slight radius to the sharp edges on the handle might make sense to improve your enjoyment of using it. I did that with one of my Fiddlebacks and now it is one of my most used knives because it fits my hand more comfortably in hard use. Thanks again for the informative review of the EDC II. Thank you, Phil! It means a lot coming from one of my favorite "Reviewers." I remember reading something about you reshaping a handle sometime back. It may take a while before I get my nerve and skill up to take on the task. I know it would bump it up a notch or two on my favorites list. Smithcrafter, you should be able to click on my username for contact options. You may need to be in web view if your using an app. I don't like posting my email on these forums. I fixed the hyperlink problem in my "Index of Fiddleback Reviews" post on Page 1. They are functional now and you are cleared for take-off. Have fun on the journey. Thanks for the kind words. You did great on your first review. You will get better each time you do one. My advice is to take lots of outdoor photos for the best natural lighting and pick the best ones to use in your review. I discard way more than I keep because my photography skills have a long way to go to match the likes of mistwalker and thurin among others around here. We are all a work in progress. Not finding your email to connect. Let me know. Thanks again! This one is a must! Classic stuff here. Every time I see/open this thread, I want to buy a FB Kephart. I agree, that is an AWESOME review and it makes me want a Kephart as well! I really like the way that patina came in, wish I knew how to do that so evenly and without the blade rusting! I'm not quite sure how Brian pimped out his patina, but I get pretty good results with mustard, minced onions and garlic. It's been my experience, that when forcing a patina, rust is inevitable to some degree. If you look at 01 the wrong way or even think about water when working with 01, it rusts. Fortunately, (if using the right ingredients) one can form a very cool patina in a matter of minutes. The rust that forms in that amount of time is very superficial and can be rubbed away with a little water and your thumb. 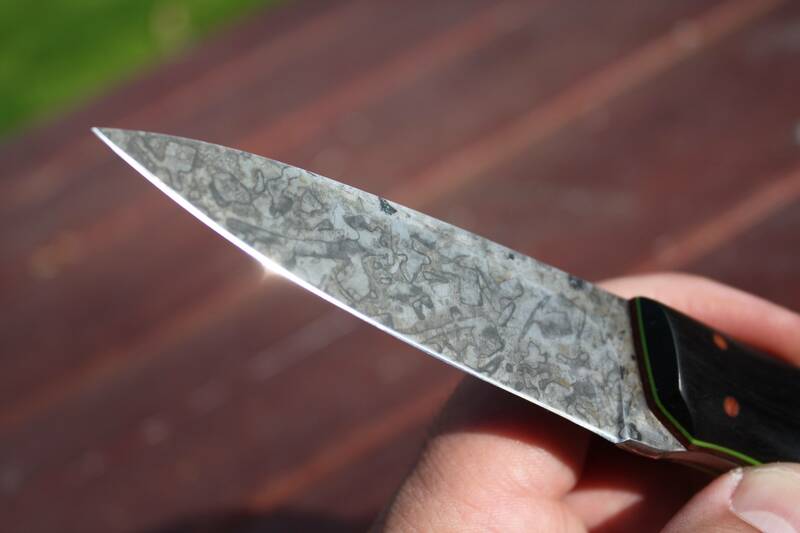 Once you form that patina, your blade has a nice layer of rust protection. It will rust if left wet or damp, but the patina gives you a little more room for error, but not much. Light rust that can be stropped or rubbed away doesn't bother me, pitting on the other hand is bad stuff. My KE bushie rocks this patina. It took me two 20 mins sessions of covering the blade with the onion, garlic, mustard trifecta to achieve the below results. I like it. Not all 01 is created equally. I've owned some 01 that I swore was stainless. Some 01 takes some effort to patina naturally. So keep that in mind if you don't plan on forcing a patina. If you do choose to force one, just have fun with it and find what works for you. newyork and Apocryphiliac like this. Josiah, that is an amazing patina. I have never done that to one of my blades, but after seeing yours I think I am going to have to give it a try! Good stuff James. Welcome to the best subforum. My fav (well ive never used anything else) has always been to use sauerkraut! Ends up very similar to yours, its always worked out so well on mine, they nearly look like the 'spalting' was never ground off. I'd posts pics if I was home... but I also wanted to add if are unhappy with the result, 'Flitz' takes it right off. Bmurray and VANCE like this. Yea thanks a lot. Your review and pics made me buy a bush hermit. So I guess it’s a smart idea on Andy’s part to ask us to post them up. Nbrackett, Lady1911 and rswanson like this. Wow! I'm honored I could act as enabler for someone with so much exposure to the brand. I saw that micarta Hermit posted and it sure does look like a hard worker. I'll be interested to hear how you think it stacks up to your production Kephart. Lady1911 and Bali-Flipper32 like this. jaz322, Bmurray and Lady1911 like this.